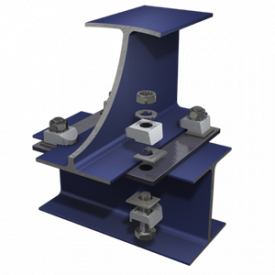 BeamClamp is an engineered clamping solution that provides a way to connect steel together without the need for on site drilling or welding. The system uses a series of individual components to provide a bespoke connection that is fully guaranteed and approved by third party organisations. The BeamClamp system provides a connection that can be both permanent or temporary and allows for on site adjustment. It is ideal for secondary steel connections and avoids the need to drill or weld on site. The BeamClamp system provides a guaranteed connection every time it is installed without the need for on site testing or relying on the skills of the installer. No removal of the protective coatings on the existing steel or the need to drill holes are required to make each connection, each connection is made using simple hand tools and semi-skilled labour.